Sleeping is part of man’s everyday life, like food, it should be taken seriously. The tools for having a very good sleep are not only limited to a good bed, a nice blanket, but also to have comfortable pillow. The Leachco Snoogle Total Body Pillow, which comes in white, is one product that could provide a very nice sleep not only because of its softness and versatility to enhance comfort and give health benefits but also because of its good quality. This product by Leachco surely qualifies to be one of the best body pillows in the market. A good night sleep will certainly define you in the morning. Some people achieved this everyday ritual while hugging pillows or just plainly lying on the bed. But somehow, they cannot attain the best results of sleep the minute they are at work, working at home for chores or leisurely travelling anywhere, when their pillows just keep on falling from the bed, distracting a worthwhile sleep. You just need a good night sleep to have the energy to accomplish tasks in the next day without the hassles. The kinds of pillow you use make much difference to have a very good night sleep. Majority of people tend to snuggle multiple pillows while they sleep because this makes them more comfortable, but otherwise, too many a pillow just make the night miserable. Leachco, one of the finest makers of body pillows, knows this. The Leachco Snoogle Total Body Pillow is an elongated C-shape designed pillow that covers more than half of your body’s surface area while you sleep. Using only one set of this magnificent pillow can make troubled sleepers with bad sleeping pattern to have a heavenly one. And that would be a nightly experience. Furthermore, this type of pillow is specifically designed to adapt to your whole body contour. To know more about this product, we have listed its salient features and other vital information regarding its advantages and disadvantages of use, so that you could have a glimpse on how it could truly serve you better, keep on reading! The Leachco Snoogle Total Body Pillow is made from 100% polyester that is why it is soft and smooth without the feeling of hardness where conventional pillows are notorious for. The customized pillow could be removed from its cover when washing is needed. This Snoogle Original is supplied with a sham-style fabric cover which is removable and machine washable. Anyone can use this pillow, whether boys or girls, men or women. There is no particular gender targeted by this product, just anyone who wants to have a terrific good night sleep or just an afternoon napping. The Leachco Snoogle Total Body Pillow is shaped like the letter C. And you may wonder, how’s that for a shape? Well, the product is intended to give sleepers total support on back, hips, tummy and even their legs and feet in just one pillow. It is designed to follow the contour of the body from head to toe. 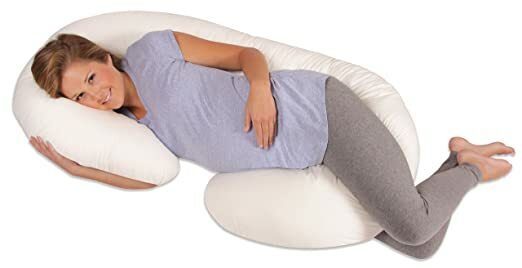 Since the pillow is primarily designed to support the whole body while you sleep, it also cuddles your tummy so it is best for expectant mothers, especially those who are “naughty” sleepers (those who sleep in different positions). Leachco claimed that the design of this pillow was developed and patented by a registered Nurse and a certified mother, so it has really a professional touch on it. Additionally, after giving birth, this pillow is still reliable for lactating mothers as it just ideal to support mother and child while nursing. If you would like multiple pillows during a night’s sleep, where you want one to snuggle your head, one that goes behind the back and another one between your knees to keep you cool, the Leachco Snoogle Total Body Pillow could give you all that comfort in just one pillow. Since it is C-shape, with the horseshoe-shaped head pillow, it allows you to achieve the needed height and position that’s just right for your feel. This pillow is proven to support your back in such a comfortable manner it can avoid sciatica or back pain. The head pillow aids in helping you breath comfortably, prevents heartburn and keep pregnancy pitfalls at bay. The Snoogle Body Pillow has also a long mid-section and it adds up more support for the back and tummy that cannot be experienced in conventional pillows. This pillow surely gives moms to wake up the next day energized and refreshed. Multiple Against One: The Leachco body pillow is a perfect replacement for multiple conventional pillows without the annoying experience of one or more pillows falling from bed while you are in the middle of dreaming. Cooling Effect: The pillow is also designed to give sleepers comfort cooling effect whether outside temperature is too hot or too cold. Perfect Also for Relaxing: If you would like an afternoon nap or just to relax while lying on the bed, this pillow is perfectly fitted to provide you the best position to make you more comfortable. Best products could really have some issues sometimes, and this pillow is no exception. We found some, albeit insignificant. Slightly Heavy: At 5.5 lbs. net weight, the pillow is slightly heavy for small children to move around. However, it is not a burden for moms who frequently travel and like to bring personal pillows with them. Not convenient for people who are too tall: The pillow is 60 inches (5 ft.) in total length when straightened, not quiet conducive for people standing more than 6 ft. 5 in. It turns out that using the Leachco Snoogle Total Body Pillow has insignificant disadvantage compared to conventional pillows or other pillows of this type. Summing up the argument, we could surely surmise that the benefits simply outplay the disadvantages. While the pillow is best for pregnant and nursing moms, anyone could enjoy its wholesome benefits, with just few exceptions.